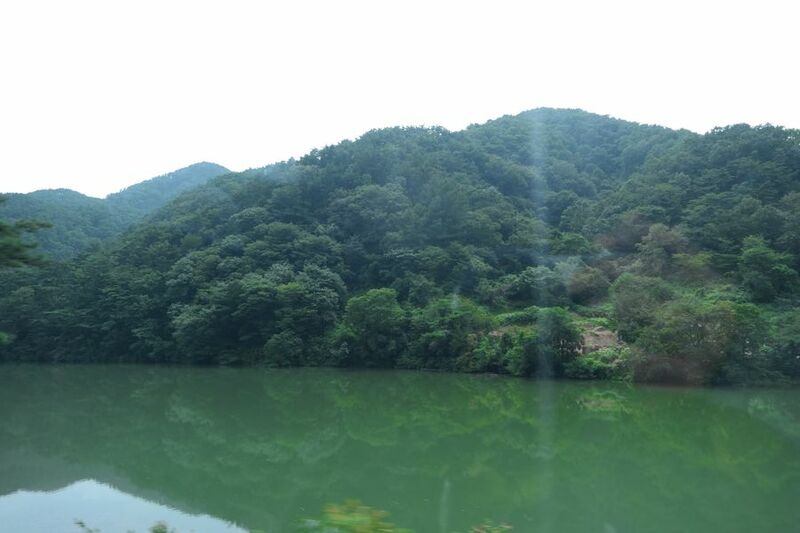 I came down the Gangcheon Mountain and passed by a small reservoir. After for a while, I got to the Sunchang town. 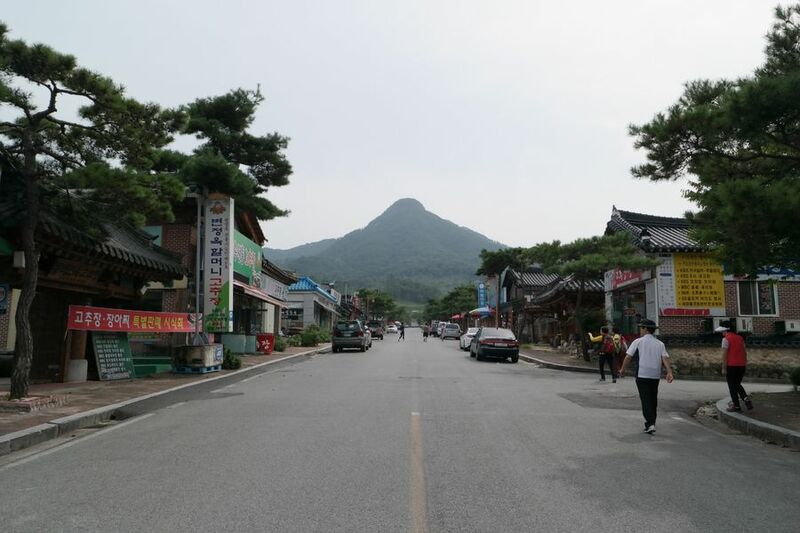 Sunchang is the region that belongs to Gun(County) and is not crowded and busy yet. 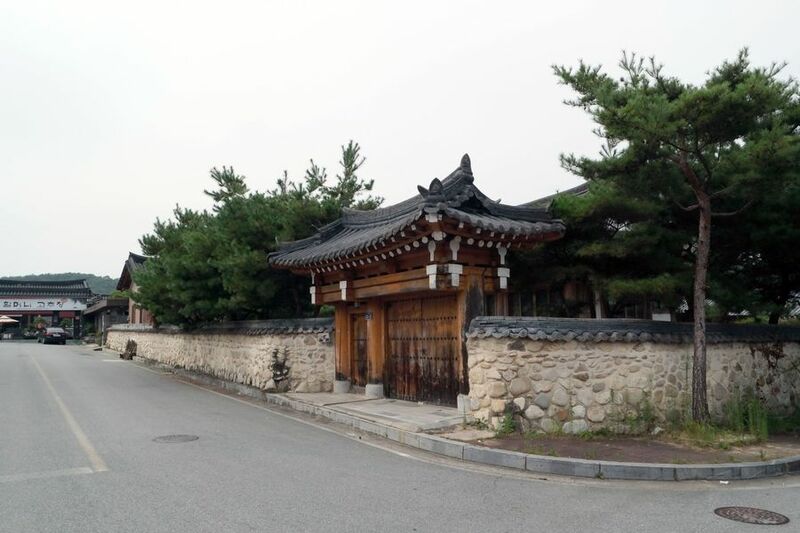 I found the village with several Hanoks(Traditional Korean-style houses) far away. 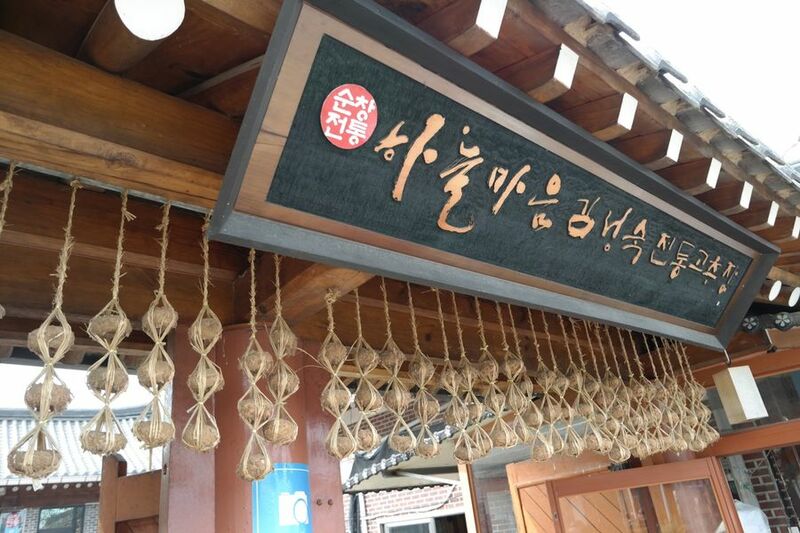 Here is the very 「Sunchang Gochujang Village」 where master craftsmen of Gochujang, Sungchang's representative specialty, have lived together and tried to promote Gochujang. Based on the middle of the road in the village, many houses of master craftsmen and stores are lining up over a few blocks. Houses that consist of traditional houses and stonewalls are in harmony with pine trees, so they create quaint and traditional atmosphere in the village. 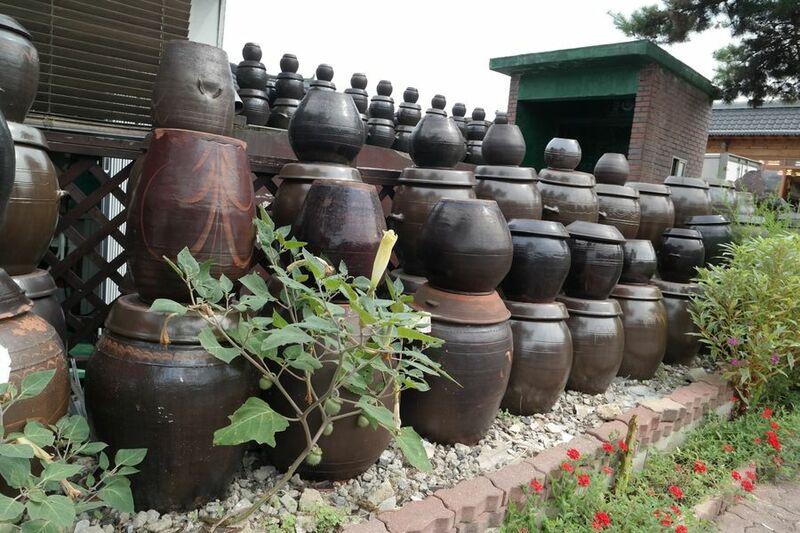 Jangdokdaes(Platform for crocks of sauces and condiments) fill all the courtyards at houses. 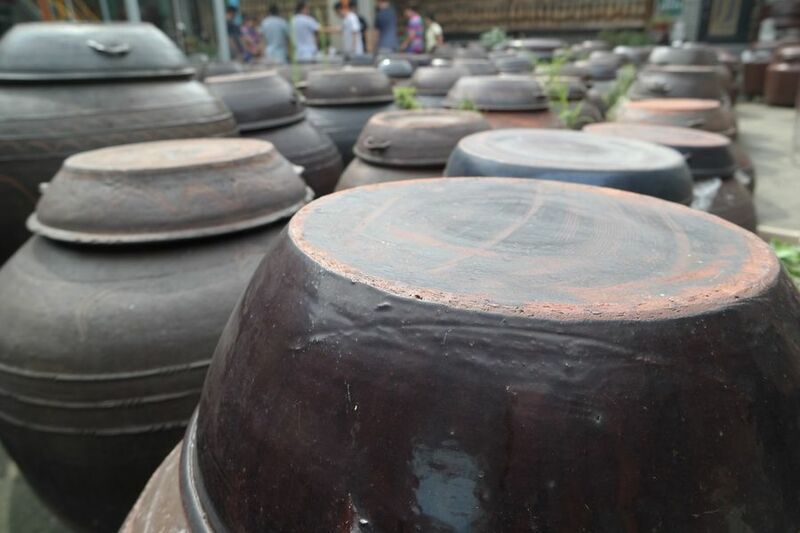 They must be jars containing Gochujang. 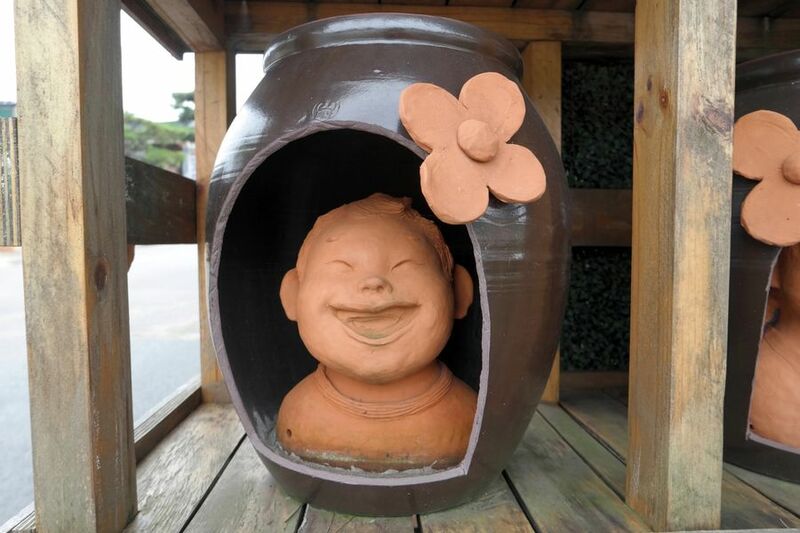 I chose a house among craftsmen's houses and walked into an entrance of the house. 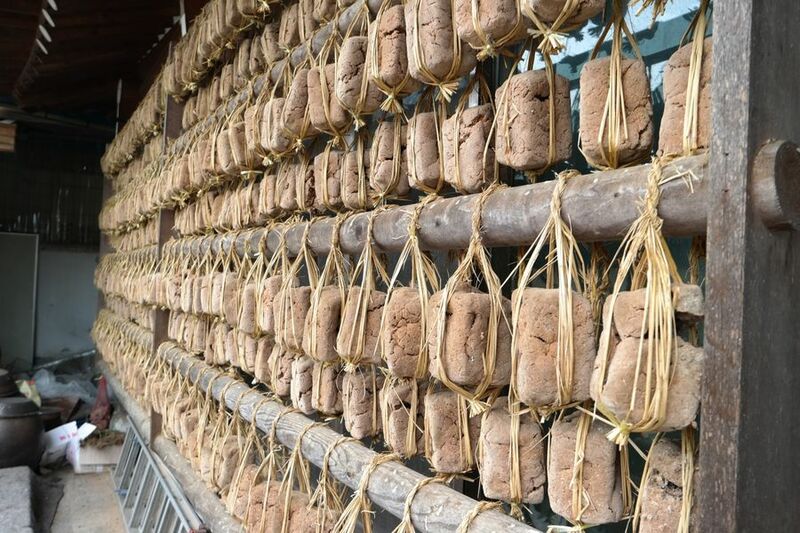 Small Meju(Blocks of fermented soybeans) were hanging in clusters. I didn't know about it at first, but these small blocks are used to make Gochujang. Inside the courtyard, these normal size blocks of Meju bound with straws have been fermented hanging in a row. 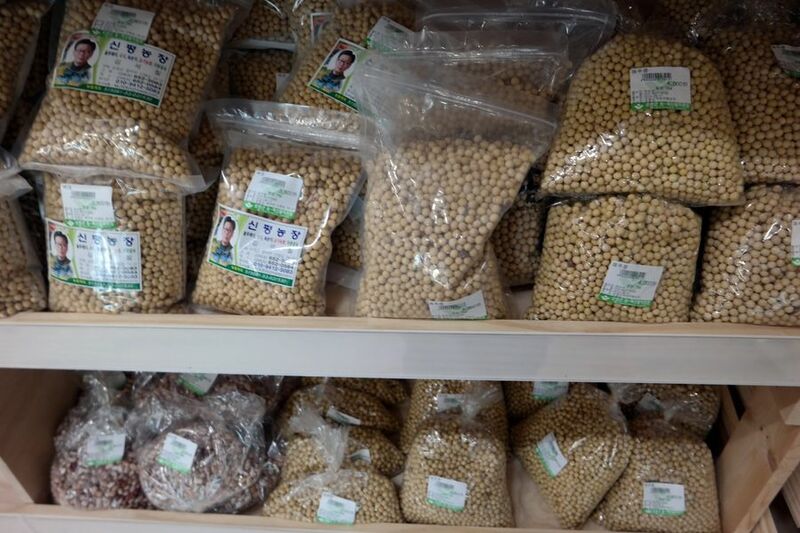 The smell of home from the blocks of fermented soybeans filled the air. 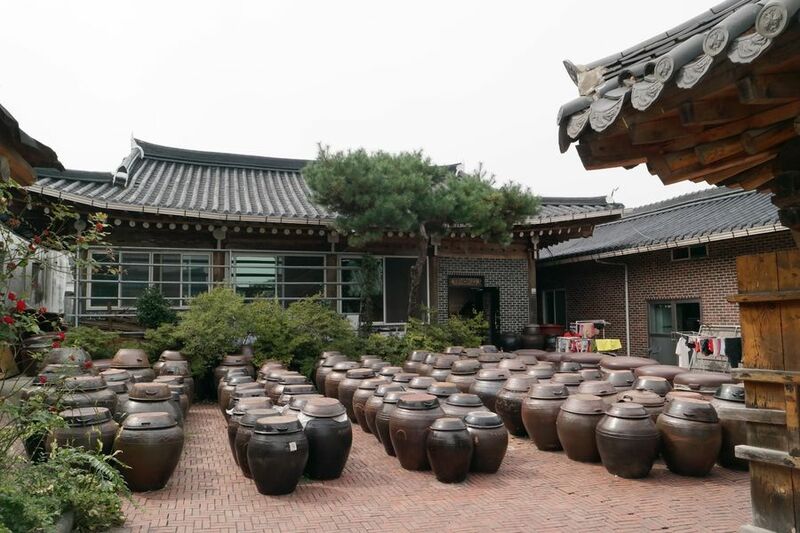 In fact it's open for selling but in the center of the courtyard, but you can see a quite fine site with various heights of jars for Gochujang. Maybe that's why there are many people who purchase Gochujang merchandises rather than those who have pictures taken with Jangdokdae in the background. We took pictures here as well. Every house gave us a try to taste their handmade Jang(Sauce) and offered some drink for free, but we were those who had already finished meal 10 minutes before. 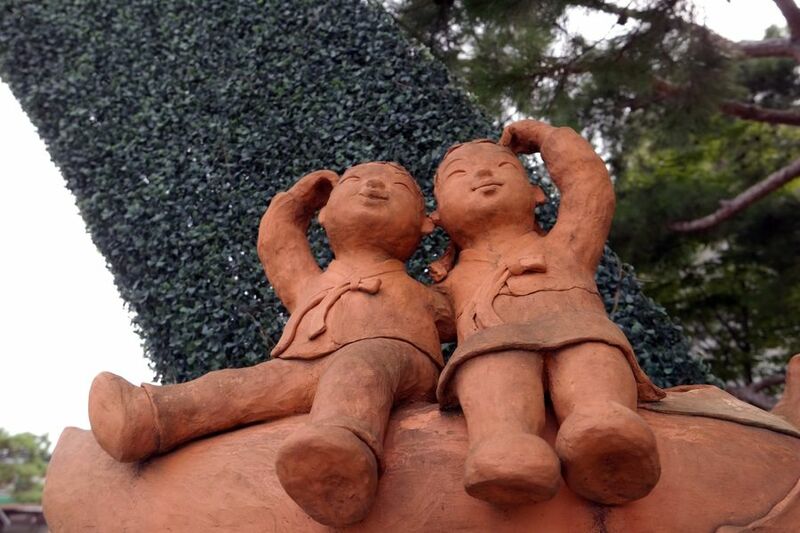 We preferred to look at Jangdokdaes and cute charming characters made of the red clay. Smiling boy and girl and children holding hot peppers. 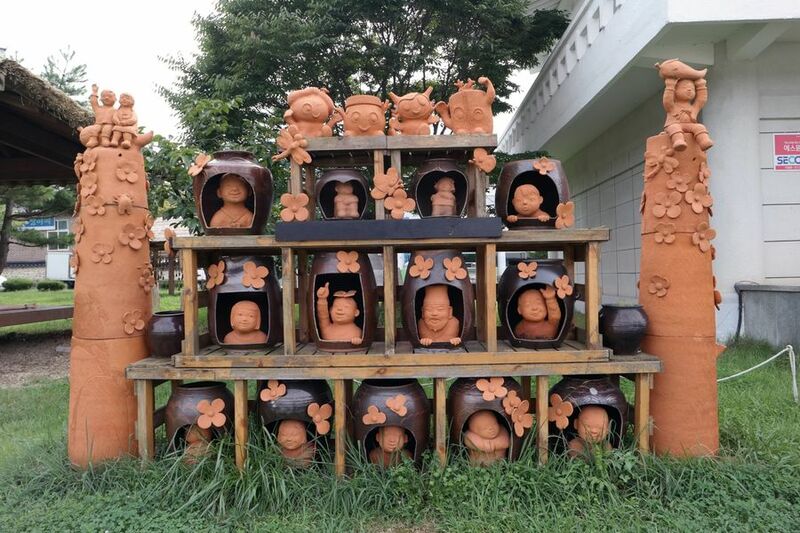 It seems good and refreshed with works of art here and there in the village. I believe this village would be a good model to follow for other regions. 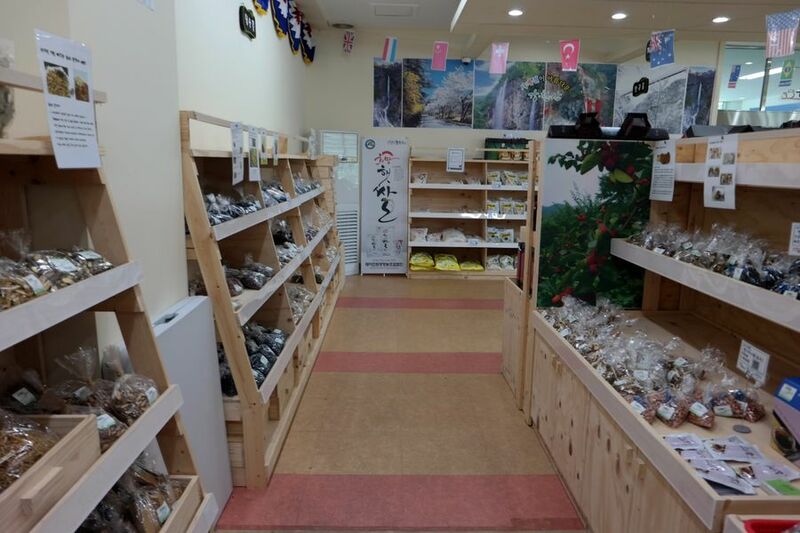 It would be better to provide various attractions by decorating their villages with local specialties rather than preparing shops only for selling local products. I have expectation that they would be transformed into another special tourist sites. 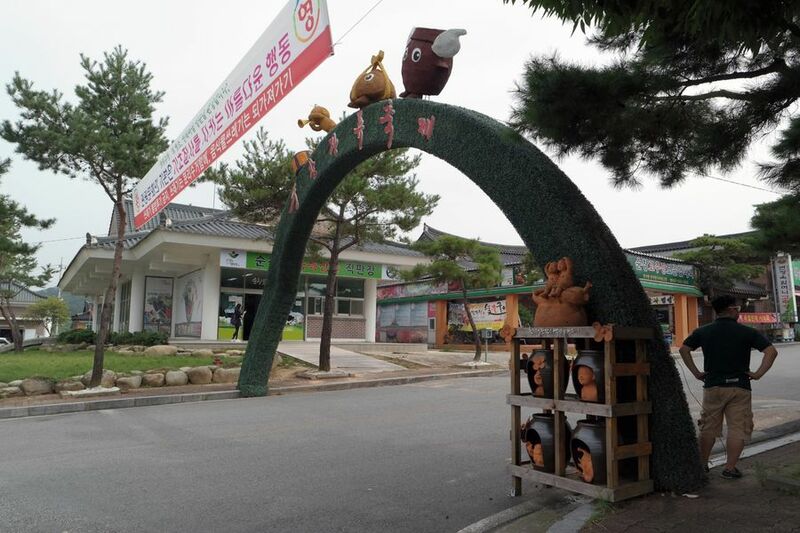 At the lowest area of the village, there is 「Agricultural Specialty Product Market」 of Sunchang-gun. 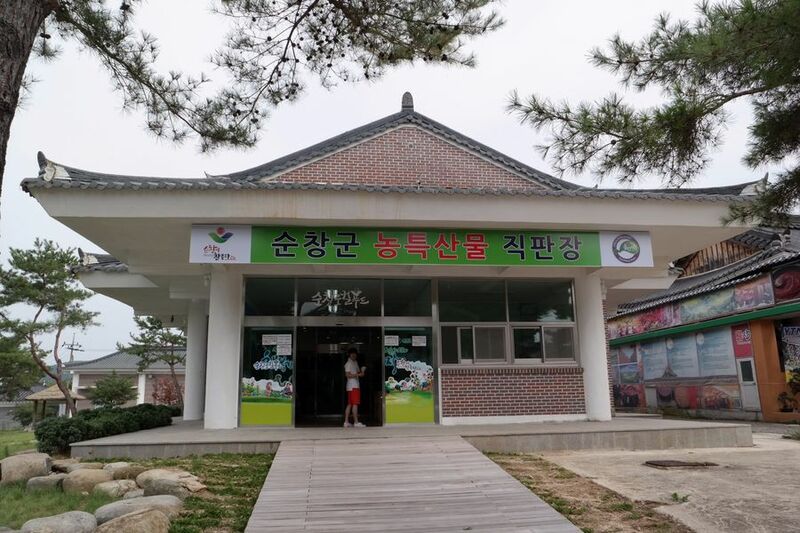 This place is kind of rest area of the village where you can use clean washroom with the cool air-conditioning. Even though I didn't have something special to buy, I went into the shop to cool down the heat. Many different kinds of merchandises were on sale at a low price. Plus, they are also reliable products that you can check exact producing districts and farmers' names. 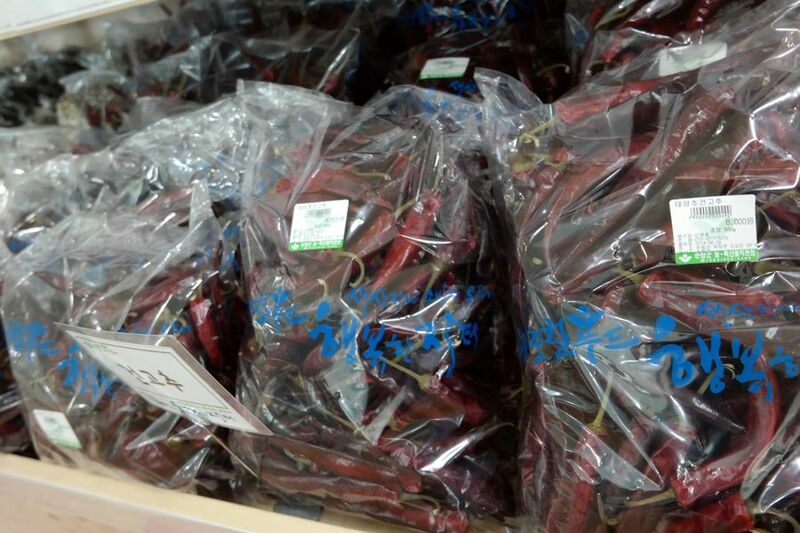 There are various products like Gochujang ingredients including beans and hot peppers, healthy tea, dried Chinese radishes, and vegetables. 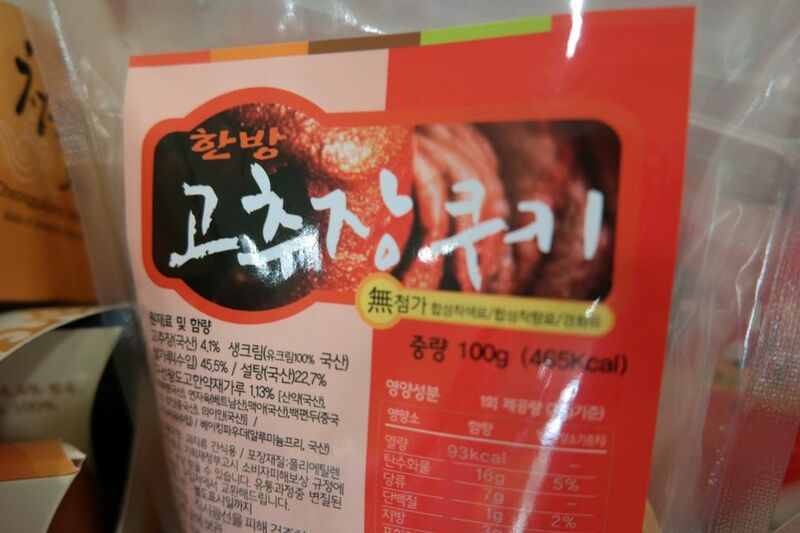 The special things are Gochujang cookies and Cheonggukjang(Fast-fermented bean paste) cookies. We are very curious about their tastes, but we just had a meal. Let's go out before our mouth water…. 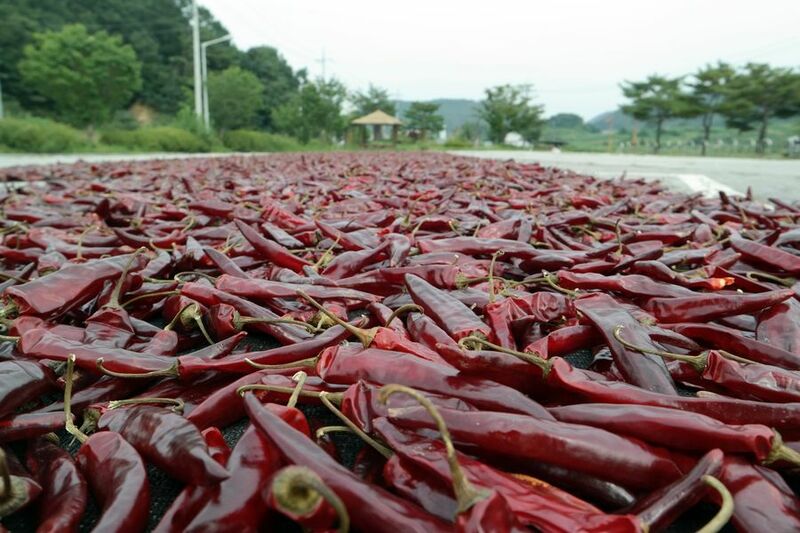 In the wide parking lot,bright red peppers were spread out and being dried under the warm sunshine. I had seen this scenery a lot in the past, but it's hard to see these days. I could see it because I came here. Then, we left the village and turned our steps toward the next tour recalling old memories. 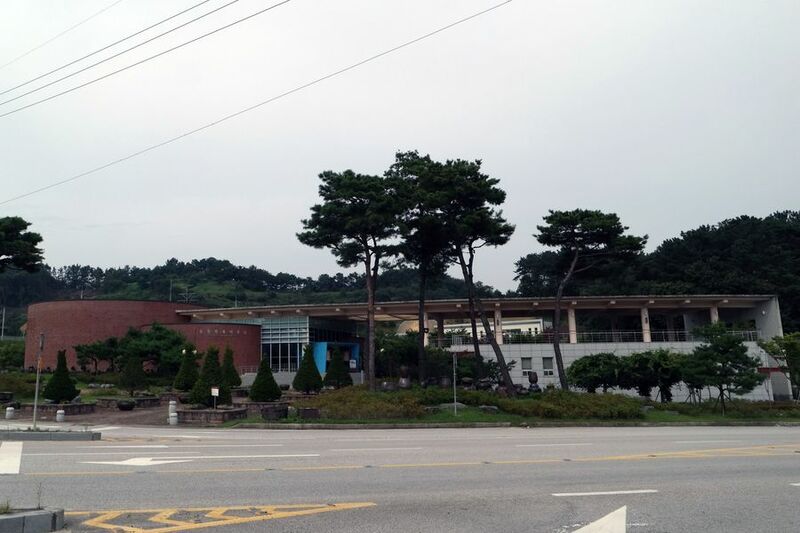 Ah… We couldn't visit here today due to the busy schedule, but you will make a good memory looking around the Gochujang museum across the street.